Yesterday I cooked our first meal in the new kitchen! It's not completely done yet - the tiles still need grouting, there are still no handles on the cabinets and drawers, and the light over the table has yet to be hung - but it's close enough that we could start unpacking dishes and pans out of the boxes they've been in for more than four months, and close enough that I could cook a meal. The tile looks great; it will look better when it's grouted, because the spaces in between won't be as dark. 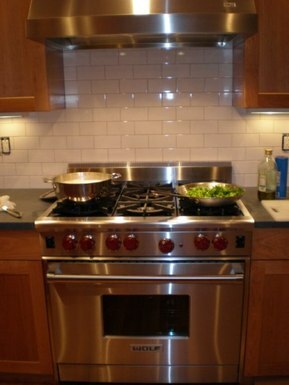 The stove is a pleasure to use - very powerful, very spacious. 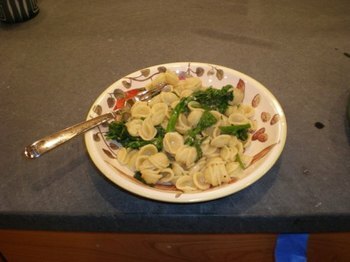 I cooked orecchiette and broccoli rabe. 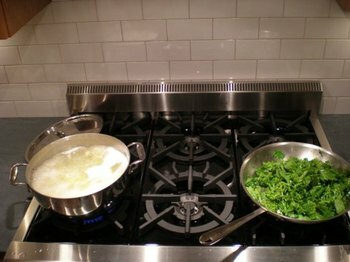 When the pasta and the broccoli rabe were done, I mixed in some grated Parmesan cheese and served it up. It's a very simple meal, the kind of thing that only takes about 15 minutes to prepare; the kind of thing I might cook on a weeknight. But it tasted wonderful! Our first meal cooked in our new kitchen after four months of waiting. I also used the new shower for the first time, but I'm not posting any pictures of that! Yeah! It looks fantastic! I'm drooling, both over the meal and the kitchen it was cooked in. You've been tagged! See my latest post on "Middle name tag" for specifics.